DSSSB has released recruitment notification for assistant teachers 2018. check DSSSB Recruitment 2018 for 9232 asst teacher posts download notification pdf to fill up the complete online application form. DASS Grade – II, Pharmacist, Legal Assistant, Assistant Superintendent, Matron, Warder Recruitment has been released. Apply online by filling up online Application Form 2017 of DSSSB Recruitment online. General and OBC Candidate: 100 Rs. Online Applications Are Submitted through SBI E-Pay Challan. Grade-IV (DASS) From 5200 to 20200 rs. 1900 rs. Junior Engineer (Civil) From 9300 to 34800 rs. 4200 rs. Lower Division Clerk From 5200 to 20200 rs. 1900 rs. Grade-II (DASS) From 9300 to 34800 rs. 4600 rs. Draughtsman Grade-III From 5200 to 20200 rs. 2400 rs. Food Safety Officer From 9300 to 34800 rs. 4200 rs. Librarian (Dte. Of Training) From 9300 to 34800 rs. 4200 rs. Librarian From 9300 to 34800 rs. 4200 rs. Field Assistant From 5200 to 20200 rs. 2000 rs. Statistical Assistant From 9300 to 34800 rs. 4200 rs. Special Education Teacher 605 posts available. Asst. Teacher (Nursery) 320 posts available. Asst. Teacher (Primary) 1394 posts available. Physical Edn. Teacher 919 posts available. Drawing Teacher 295 posts available. Domestic Science Teacher 199 posts available. PGT Physical Education- Male 86 posts available. PGT Physical Education- Female 74 posts available. PGT Fine Art –Male 17 posts available. PGT Fine Art – Female 13 posts available. PGT Music- Male 1 posts available. PGT Music- Female 2 posts available. PGT Biology – Male 8 posts available. PGT Biology – Female 7 posts available. PGT Chemistry – Male 11 posts available. PGT Chemistry – Female 10 posts available. PGT Commerce-Male 13 posts available. PGT Commerce- Female 15 posts available. PGT Economics- Male 10 posts available. PGT Economics- Female 22 posts available. PGT History – Male 92 posts available. PGT History – Female 113 posts available. PGT Pol. Science- Male 88 posts available. PGT Pol. Science- Female 115 posts available. PGT Sanskrit – Male 29 posts available. PGT Sanskrit – Female 19 posts available. PGT Maths – Male 8 posts available. PGT Maths – Female 12 posts available. PGT Physics – Male 9 posts available. PGT Physics – Female 9 posts available. PGT Punjabi – Male 1 posts available. PGT Punjabi – Female 2 posts available. PGT Urdu – Male 2 posts available. PGT Agriculture – Male 1 posts available. PGT Sociology – Male 42 posts available. TGT English – Female 311 posts available. TGT Natural Science- Male 222 posts available. TGT Natural Science- Female 194 posts available. TGT Bengali –Female 1 posts available. TGT Hindi – Male 271 posts available. TGT Hindi – Female 151 posts available. TGT Punjabi – Male 88 posts available. TGT Punjabi – Female 126 posts available. TGT Sanskrit – Male 114 posts available. TGT Urdu – Male 78 posts available. TGT Urdu – Female 135 posts available. Educational and Vocational Guidance Counsellor (EVGC) – Male 222 posts available. PGT Computer Science-Male 98 posts available. PGT Computer Science-Female 99 posts available. PGT Home Science – Female 114 posts available. TGT Social Science- Male 303 posts available. Educational and Vocational Guidance Counsellor (EVGC) – Female 210 posts available. TGT English – Male 367 posts available. TGT Sanskrit –Female 140 posts available. PGT Sociology -Female 41 posts available. TGT Social Science- Female 300 posts available. PGT Urdu – Female 05 posts available. TGT Maths – Female 324 posts available. PGT English – Female 83 posts available. PGT Geography- Male 52 posts available. PGT Geography-Female 17 posts available. PGT English – Male 73 posts available. PGT Hindi – Male 113 posts available. PGT Hindi – Female 131 posts available. Delhi Sub ordinate Staff Selection Board Released Recruitment for various posts. candidates must fill up DSSSB Application Fomr 2017 Online to apply for all of the posts. We request aspirants to apply before 21st november 2017 and the start date to apply the online application form is 1st Nov 2017. Delhi DSSSB Grade II (DASS) Recruitment & Application Form Online: 221 vacancies. DSSSB Pharmacist (Homeopathic) Recruitment Notification/ Online Form: 40 vacancies. Delhi DSSSB Legal Assistant Recruitment & Application Form Online: 13 vacancies. DSSSB Asst Superintendent Recruitment Notification/ Online Form: 96 vacancies. Delhi DSSSB Matron Recruitment & Application Form Online: 64 vacancies. DSSSB Warder Recruitment Notification/ Online Form: 401 vacancies. DSSSB Delhi Teacher Recruitment 2017. Today Delhi govt. released notification regarding posts of Urdu & Punjabi teachers 1379 Posts apply at www.delhi.gov.in. High Court Order 26031 Posts should be available under DSSSB Recruitment for the year 2017. (UPDATED 25th, May 2017) Delhi has released notification regarding DSSSB JBT Teacher Recruitment 2017. basically, forms are going to start in July 2017. aspirants are requested to Check the given below Delhi DSSSB Guest Teacher Recruitment Notification and Delhi TGT PGT Job Vacancy 2017. as said, there are total of 9500 jobs which are going to come for aspirants those who are waiting for it. Kindly Go Below and Find the Images of News in which proper details are mentioned. and discuss in the comment box below. The Delhi subordinate staff selection board (dsssb) previously released notification for 10,000 teachers which were required in Delhi & NCR. now after not that long. Delhi govt. released national notification regarding recruitment of punjabi and Urdu teachers for govt. job. there are total 1379 vacancies released till the date. Finally Time has arrived when, Delhi teacher eligibility, age limit, test date, Delhi teacher interview dates, DSSSB Teacher notification 2017 and apply online for Dsssb Delhi Teacher Recruitment just go below.edudel Teacher Notification 2017. Edudel released official notification to fill up posts for delhi govt. of Punjabi and Urdu teachers. Delhi Teacher Recruitment 2016. Punjab Teacher. N.A www.edudel.nic.in. Delhi Teacher Recruitment 2016. Urdu Teacher. N.A www.edudel.nic.in. 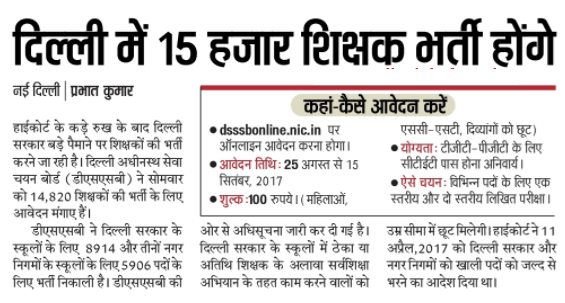 As per news mentioned in Times of India, Indian Express etc they have mentioned that Delhi Government has decided to DSSSB Recruitment of more than 1300 candidates as a teacher posts. Starting Date for submission of online application form Coming Soon. Last date to submit online application form Coming Soon. Post No: 11/17 Junior Engineer (Civil) 70 vacant seats. Post No: 12/17 Junior Engineer (Mechanical) 15 vacant seats. Post No: 13/17 Patwari 140 vacant seats. Post No: 14/17 Legal Assistant 13 vacant seats. Post No: 15/17 Special Educator 1540 vacant seats. Post No: 16/17 Primary Teacher 4366 vacant seats. Post No: 17/17 Special Education Teacher 496 vacant seats. Post No: 18/17 Assistant Teacher (Nursery) 320 vacant seats. Post No: 19/17 Assistant Teacher (Primary) 1394 vacant seats. Post No: 20/17 Physical Education Teacher 919 vacant seats. Post No: 21/17 Drawing Teacher 295 vacant seats. Post No: 22/17 Domestic Science Teacher 199 vacant seats. Post No: 23/17 Post Graduate Teacher (PGT) Home Science – Female 114 vacant seats. Post No: 24/17 Post Graduate Teacher (PGT) Physical Education – Male 86 vacant seats. Post No: 25/17 Post Graduate Teacher (PGT) Physical Education – Female 74 vacant seats. Post No: 26/17 Post Graduate Teacher (PGT) – Fine Arts – Male 17 vacant seats. Post No: 27/17 Post Graduate Teacher (PGT) – Fine Arts – Female 13 vacant seats. Post No: 28/17 Post Graduate Teacher (PGT) – Music – Male 01 vacant seats. Post No: 29/17 Post Graduate Teacher (PGT) – Music – Female 04 vacant seats. Post No: 30/17 Post Graduate Teacher (PGT) – Biology – Male 08 vacant seats. Post No: 31/17 Post Graduate Teacher (PGT)- Biology – Female 07 vacant seats. Post No: 32/17 Post Graduate Teacher (PGT) – Chemistry – Male 11 vacant seats. Post No: 33/17 Post Graduate Teacher (PGT) Chemistry – Female 10 vacant seats. Post No: 34/17 Post Graduate Teacher (PGT) Commerce – Male 13 vacant seats. Post No: 35/17 Post Graduate Teacher (PGT) Commerce – Female 15 vacant seats. Post No: 36/17 Post Graduate Teacher (PGT) – Economics – Male 10 vacant seats. Post No: 37/17 Post Graduate Teacher (PGT) – Economics – Female 22 vacant seats. Post No: 38/17 Post Graduate Teacher (PGT) – English – Male 73 vacant seats. Post No: 39/17 Post Graduate Teacher (PGT) – English – Female 83 vacant seats. Post No: 40/17 Post Graduate Teacher (PGT) – Hindi – Male 113 vacant seats. Post No: 41/17 Post Graduate Teacher (PGT) – Hindi – Female 66 vacant seats. Post No: 42/17 Post Graduate Teacher (PGT) – History – Male 92 vacant seats. Post No: 43/17 Post Graduate Teacher (PGT) – History – Female 113 vacant seats. Post No: 44/17 Post Graduate Teacher (PGT) – Political Science – Male 88 vacant seats. Post No: 45/17 Post Graduate Teacher (PGT) Political Science – Female 115 vacant seats. Post No: 46/17 Post Graduate Teacher (PGT) – Sanskrut – Male 29 vacant seats. Post No: 47/17 Post Graduate Teacher (PGT) – Sanskrut – Female 19 vacant seats. Post No: 48/17 Post Graduate Teacher (PGT) – Geography – Male 52 vacant seats. Post No: 49/17 Post Graduate Teacher (PGT) – Geography – Female 17 vacant seats. Post No: 50/17 Post Graduate Teacher (PGT) – Mathematics – Male 08 vacant seats. Post No: 51/17 Post Graduate Teacher Mathematics – Female 12 vacant seats. Post No: 52/17 Post Graduate Teacher Physics – Male 09 vacant seats. Post No: 53/17 Post Graduate Teacher Physics – Female 09 vacant seats. Post No: 54/17 Post Graduate Teacher Punjabi – Male 01 vacant seats. Post No: 55/17 Post Graduate Teacher Punjabi – Female 02 vacant seats. Post No: 56//17 Post Graduate Teacher (PGT) – Urdu – Male 02 vacant seats. Post No: 57/17 Post Graduate Teacher (PGT) – Urdu – Female 10 vacant seats. Post No: 58/17 Post Graduate Teacher (PGT) – Agriculture – Male 01 vacant seats. Post No: 59/17 Post Graduate Teacher (PGT) -Sociology – Male 42 vacant seats. Post No: 60/17 Post Graduate Teacher (PGT) – Sociology – Female 41 vacant seats. Post No: 61/17 Trained Graduate Teacher – (TGT) English – Male 367 vacant seats. Post No: 62/17 Trained Graduate Teacher -(TGT) English – Female 311 vacant seats. Post No: 63/17 Trained Graduate Teacher (TGT) Mathematics – Male 286 vacant seats. Post No: 64/17 Trained Graduate Teacher (TGT) Mathematics – Female 324 vacant seats. Post No: 65/17 TGT) Natural Science – Male 222 vacant seats. Post No: 66/17 TGT) Natural Science – Female 194 vacant seats. Post No: 67/17 TGT) Social Science – Male 303 vacant seats. Post No: 68/17 Trained Graduate Teacher Social Science – Female Candidates 300 vacant seats. Post No: 69/17 Trained Graduate Teacher (TGT) Bengali – Female 01 vacant seats. Post No: 70/17 Trained Graduate Teacher (TGT) Hindi – Male 271 vacant seats. Post No: 71/17 Trained Graduate Teacher (TGT) Hindi – Female 151 vacant seats. Post No: 72/17 Trained Graduate Teacher (TGT) Punjabi – Male 88 vacant seats. Post No: 73/17 Trained Graduate Teacher (TGT) Punjabi – Female 126 vacant seats. Post No: 74/17 Trained Graduate Teacher (TGT) Sanskrut – Male 114 vacant seats. Post No: 75/17 Trained Graduate Teacher (TGT) Sanskrut – Female 140 vacant seats. Post No: 76/17 Trained Graduate Teacher Urdu – Male 78 vacant seats. Post No: 77/17 (TGT) Urdu – Female 135 vacant seats. Post No: 78/17 Educational and Vocational Guidance Counselor (EVGC) – Male 222 vacant seats. Post No: 79/17 Educational and Vocational Guidance Counselor (EVGC) – Female 210 vacant seats. The educational facilities are provided in stages i.e. pre-primary, primary, middle, secondary, senior secondary and university level. Pre-primary and primary educations are mainly the responsibility of the local bodies. Middle, secondary and senior secondary education is primarily looked after by Directorate of Education, Government of Delhi. Although pre-primary and primary education is mainly the responsibility of the local bodies, the Govt. of DSSSB Recruitment 2017 has converted its 326 schools into composite schools now known as Sarvodaya Vidyalayas having classes from I to XII. At the University level, Govt. of Delhi is running 28 Degree Colleges being funded by UGC and Delhi Govt. Recruitment Organisation/Dept. Name: Government of Delhi. Location of Job: All over the Delhi and NCR. Name of Vacancies: Urdu and Punjabi Teacher recruitment. Total Number of Vacancies: 1379 Posts available. Starting Date For Online Application Form: Available soon. Closing Date For Online Application Form: Available soon. this Is A Very Huge Recruitment Drive For Qualified People Who Wish to Become a Delhi Teacher PRT-TGT-PGT DSSSB Teacher Vacancy. Check the Complete Detailed Information about the Organisation and Recruitment Drive. People Who all Are Searching for DSSSB PRT Teacher/Lecturer Recruitment 2017 Need not to Go Anywhere else. Just Goto Our Menu click on the Jobs link and Finally on the Right Sidebar Click on the Government Jobs Panel or on the DSSSB PRT Teachers Jobs Panel or Which Ever Suits the Most. Government of Delhi has released official notification to fill up 9,500 posts of various guest teachers among delhi. basically, there are music teachet, prt teacher, tgt teacher, pgt teacher and various other teacher vacancies available. kindly check the images given above and below and comment below for discussion. The result of engagement of TGTs and Primary teachers on contract basis by SSA will he available in Departmental Website www.edudel.nic.in. Educational qualification required for candidate must have cleared B.Ed (bachelor of Education) from any recognized university. Minimum Age limit is 20 years. selection would based on written test and then final interview of selected candidates. Application Fees: Refer official notification. Fill Out the DSSSB Primary Teacher Recruitment 2017 Online Application Form. Instruction to Candidates:TGTs and Primary Teachers. Result Engagement of Primary School Teachers. Result for Engagement of Subject Specific Teacher (TGT) on Contract Basis under SSA. List of invalid IDs of the Applicants for the Post of TGT/ATs on Contract Basis under SSA. Process for Making Correction in Percentage of Marks for Engagement of Primary School. Correction in Percentage of Marks for Engagement of Primary School Teachers. Find Application ID for Engagement of Primary School Teachers. Engagement of Primary School Teachers Sarvodaya Schools. TGT Teachers Subjects in schools DOE Delhi. Well DSSSB Vacancy Delhi Teacher Recruitment 2017 & 2018 was announced for Urdu and Punjabi teachers in month of June 2016. well thousands of candidates recently applied for it via our provided platform. the main focus started at www.delhi.gov.in when the organisation announced that recruitment of near about 1500 teachers throughout the state. near about 30,000 candidates applied only for these applications only. now waiting candidates wants to check DSSSB Primary Teacher Recruitment 2017 will be available on delhi.gov.in online. well, till now it is not displayed on the official website, but said on news channels. all candidates who are waiting for teacher job in Delhi must check previous dsssb recruitment 2017-18. The Delhi subordinate service selection board announced recruitment after an order of High Court for 26031 teachers. therefore news is been highlighted from today only. DSSSB Delhi Teacher Recruitment 2017 releasing near about 26031 posts available to fill at delhi.gov.in. This 50 per cent DSSSB recruitment 2017 is startling. It is too high a figure. Where is the budget going, As DSSSB Teacher Recruitment 2017 announced Justice Manmohan asked the AAP government and the corporations after the court was told that 9,000 new teaching posts were being created even though as many as 26,031 vacancies existed. Advocate Ashok Aggarwal, appearing for the NGO, told the court that currently there were DSSSB Vacancy Teachers 26,031 posts Recruitment Notification, including special educators for differently-abled children, lying vacant in municipal and Delhi government run schools. Please tell what documents r required for assistant teachers . I hv done graduation and Ntt and Ptt also ….what’s my scope . Sir, I m m.a. in pub. Ad.and pol.sci.,b.ed,ctet,rtet also.age 34. Any chance ? Post code 2/13 ka next result kab aayega. Sir,मेरे मित्र की DOB 1984है.क्या tgt मे form भर सकता है?CTET PASS है.आयु 30से ऊपर हो गई. Dsssb ki merit kis base pe banegi??? 10th+12th+B.A+M.A+b.ed sable marks ko add karke percentage nikalege ya kiss or method se? Kis standard take k percentage count hinge or B.Ed k marks kese count honge? Sir muz se form bhrtee time kuch galti ho gyi h mne B.A k passing year 2007 ki zaghe 2006 bhr dea h .Is ka koi soluation ho to plze bato ya dsssb k helpline no.ho to bo bta do . Maine JBT(Diploma in education) kiya hai or graduation bhi kiyaa hua hai or ctet PRT ka clear bhi hai, mai kis subject ke apply kar skta hu guest taecher ke liye. Pgt vacancy kb tk nikalenge. Sir, Punjabi Teacher ke liye b.ed compulsory hai ? Sir, Punjabi Teacher ke liye b.ed compulsory hai ?? I have done my JBT nd also cleared my CTET ..kindly tell me whether can I apply for this recruitment 2017 as guest teacher?? Sir, kya guest teacher baad mein regular k liye apply kr sakte hai? sir, c-tet nahi ho to,apply kar sakty hai. sir, TGT bina form apply kar sakty hai. Sir form fill karte hue ek mistake ho gai 12th ki percentage kam bhar di koi tarika h usko theek karne ka. Sir meri percentage 66.00 h or Maine galti she 48.08 bher di h.
Geeta ji apne konse browser se form fill kiya tha. M CTET ka roll no fill nhi kr pa rha hu. Please help. Sir pls prt vscancy kb niklegi pls tell me meri age over honr ko hai or yeh job ek sapna. I have completed fifth year diploma in fine arts from PKK,Chandigarh. When will I drawing teacher. This is India my friends . Govt se Juda koi kaam aajtak aasaan hua he jo ab ho jayega. Rula deti he Yeh sarkari Jobs . I have also done B. ED but I don’t expect anything from my Delhi Govt so better he private jobs kr lo sab ke sab , nhi to isse be haath dhone pad jayegen. ? Sir ,PRT govt. Jobs kab tak niklengi. Please give me some idea. Drawing & Painting DSSSB ki vacancy kb nikalegi . Drawing & Painting ki vacancy kb nikalegi . Sir pls tell me prt vacancy when will realise. Sir, nursery teacher ki vacancy kb tk niklegi….. aur maine ecce kiya hai scert,Delhi se…ager mera ctet clear hai tou mai primary teacher k liye apply kar sakti hu. Sir, kindly inform when vacancy for tgt home science will be released. TGT ki vacancy kab take aayegi. any information so plz tell me. DSSSB. SE TEACHERS VACENSY KB AA RHI H.
Delhi me tgt or pgt Teacher vacancy kb tk aa rhi h…..
Sir,i have completed b. Com, b.ed .any job for me. Tell me abt best coaching centre for tgt english , pgt too In delhi or ggn plz notify soon……? recuritment notice kab tak aayega. Dsssb me KB tk teacher vecancy niklegi mere ko jalddi bataobAtao……..DP Singh. kab tak inzaar krna padega or ek saal to ho gaya dekhte dekhte ki kab aayegi tgt pgt ki new vacancy ummeedo kiran dubti ja rahi h koi to new vacancy laagu karva do yaar pata nhi kitne janam lene padenge Govt. Teacher ban ne ke liye he! Bhagwan ab tu hi koi chamatkar kar de. From-Neeraj kumar M.A-Sanskrit, B.ed, CTET. Mob. 7834855885 koi to soochana de do yaar. i am B.Tech from CSE for computer teacher pgt CTET is required? Koi vecency ni h ye to sirf janta ko mentl bnana h 1 sal ho gya bs notification hi aaya h or agr aa jae to kejrii j hm sbke god h aap kejrival jindabad …. Dsssb tgt pgt ki vacancy kab tak aa rahi h sir. dsssb pol science m ur list m 13candidates reserve category k lia h.koi court m jana chahe to plz tell. sir/madam kripya bataye ki pgt tgt vacancy form kab tak niklenge. Thanks for your reply sir..
2012 pgt pol sci. result declared and I got 115 marks and short listed candidates cut off is 130. -is second list come again? Sanskrit ki vacancy bhi aayegi kya. ? please tell about women age in general category.for tgt and pgt.